This Monthly Budget template in excel format and its uniqueness cannot be found elsewhere.One really cool attribute of this interactive template is its convenience and hassle free format designed to make monthly budgeting exciting.Simply fill in the required text and numbers in the category and budget fields then this amazing Monthly Budget template brings up graphs and makes the necessary calculations with its inbuilt formulae. SKU: 0257. Category: Planning & Management. Tag: NE0257 Namozaj MONTHLY BUDGET TEMPLATE. This is a template of Monthly Budget Template in excel format. We also have an Arabic version with Template Number NA0257. This revolutionary and stylish template helps you work with a budget, simply and easily while being effective. 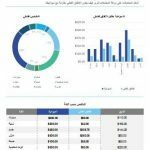 The template has beautiful graphs and tables and created with high quality to facilitate easy filling of information. 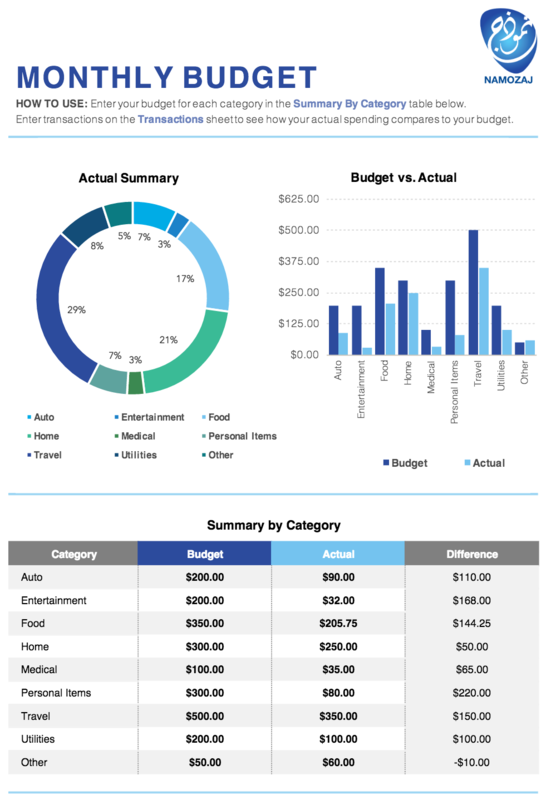 This template has 2 sheets: budget summary by category sheet and a transactions sheet. For Who and Which countries is the template designed?